Making the most of closet and storage space is one of our specialties here at American Insulation. We offer one of the largest selections of quality closet and shelving options in Huntsville, Decatur or a surrounding area in Alabama. From design to installation, we offer solutions to help you get and stay organized. These are more than just off-the-shelf organizers! 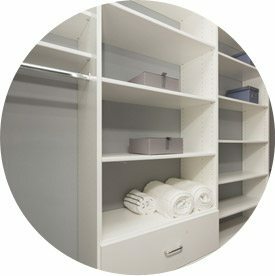 There is no limit to the style and unique touch a custom closet can add to your Huntsville, Alabama area home. Give the American Insulation team a call or contact us online. We’re looking forward to working with you.